We’d love your help. Let us know what’s wrong with this preview of Brave New Girls by Paige Daniels. Dive into a universe of sci-fi wonders. This collection of sci-fi shorts features a variety of brainy young heroines—girls who engineer, tinker, experiment, and more. Voyage to far-off galaxies with girls who use their science savvy to fix rovers, rescue friends, and protect alien critters. Visit steampunk realms where young ladies put their skills to the test building mech Dive into a universe of sci-fi wonders. This collection of sci-fi shorts features a variety of brainy young heroines—girls who engineer, tinker, experiment, and more. Voyage to far-off galaxies with girls who use their science savvy to fix rovers, rescue friends, and protect alien critters. Visit steampunk realms where young ladies put their skills to the test building mechanical wonders and solving mysteries. Trek across sci-fi landscapes with girls who save androids and repair robots. Journey to post-apocalyptic futures where heroines use their tech know-how to bring down overlords and spread the most dangerous thing of all… knowledge. And drop in on a few near-future heroines who use their smarts to take down supervillains and bring a little more understanding into the world. T. Eric Bakutis, Elisha Betts, Steph Bennion, Bryna Butler, Margaret Curelas, Paige Daniels, Kay Dominguez, Brandon Draga, George Ebey, Mary Fan, A.A. Jankiewicz, Evangeline Jennings, Jamie Krakover, Jeanne Kramer-Smyth, Stephen Landry, Karissa Laurel, Michelle Leonard, Meg Merriet, Jelani-Akin Parham, Josh Pritchett, Holly Schofield, and Lisa Toohey. To ask other readers questions about Brave New Girls, please sign up. When I reviewed the science fiction/mystery crossover anthology, Love, Murder & Mayhem: Cosmic Tales of the Heart Gone Deadly Wrong, I particularly mentioned author Mary Fan's AI Sherlock story and the Brave New Girls anthologies which she co-edits with author Paige Daniels. Mary Fan noticed my review and sent me an ARC of Brave New Girls # 2 in return for this honest review. Let me say that I was impressed by the series concept which is to encourage girls to study the sciences and enter sci When I reviewed the science fiction/mystery crossover anthology, Love, Murder & Mayhem: Cosmic Tales of the Heart Gone Deadly Wrong, I particularly mentioned author Mary Fan's AI Sherlock story and the Brave New Girls anthologies which she co-edits with author Paige Daniels. Mary Fan noticed my review and sent me an ARC of Brave New Girls # 2 in return for this honest review. Let me say that I was impressed by the series concept which is to encourage girls to study the sciences and enter scientific professions. The proceeds from this anthology go to the scholarship fund of the Society of Women Engineers. Although I am not myself a scientist, I would like to see a world where more girls consider these fields. My favorite story was "Circus in the Sky" by Lisa Toohey. It combines two subjects which are perennial themes in my reading--circuses and animal welfare. Let me be clear that I don't enjoy circuses that imprison animals in order to entertain humans. Like Kaleigh, the protagonist of "Circus in the Sky", I believe animals belong in their natural habitats. This story is different from many others in this anthology. Kaleigh isn't an inventor or a tinkerer, but she does have scientific ambitions. Kaleigh is also very courageous. She stands up for an animal who has no other advocate within the circus that employs her. I was delighted to meet someone like her within the pages of a book. 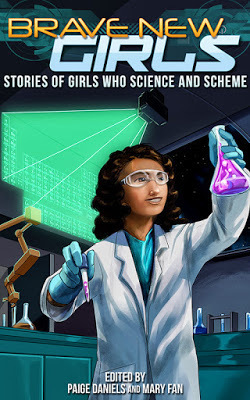 I thought there was enough worthwhile content in Brave New Girls #2 to recommend it to teens in search of science fiction adventure starring girls using science to achieve their goals. “The Case of the Missing Sherlock” by Mary Fan: Chevonne Watson's best friend is an AI gal named Sherlock, who's gone missing. Chevonne must have all her science smarts and mystery-solving wits about her to find and rescue her, because there's nothing artificial about their friendship! “The Non-Existence of Gravity” by Steph Bennion: Cethlenn and her aunt 'Mad Morrigan' play a whatif string theory game that someone else takes to a dangerous level. “Sweet Emotion” by Bryan Butler: Bridget knows that in high school, school spirit can be addictive. Maybe dangerously so. “Dangerous Territory” by Holly Schofield: Carly has to repair her dilapidated Mark Q Rover to get pregnant stepmom Mary across the Martian desert before it's too late. “Let Androids Eat Cake” by Meg Merriet: Heloise is anticipating Marie Antoinnete's execution with excitement, because she knows the "evil witch' is getting her just desserts. But drop this bit of history into a steampunk ambiance, and you never know WHAT will happen! “Circus in the Sky” by Lisa Toohey: Kaleigh was raised in the circus lifestyle on a giant Space Circus. Her love for the beasts she trains brings her to an important conclusion when she meets Mr. Kogen, a giant silver-backed bearish creature, who has some very non-creature talents. How can Karleigh save Mr. Kogen and herself? “Our Very Respected and Always Benevolent Leader” by Kay Dominguez: A giant ship has landed on Ava's planet. It won't communicate. It fights back when it is prodded, but otherwise it is silent. And it is impenetrable. “The 17th Quadrennial Intergalactic Neo-Cultural Expo and Science Fair” by Jeanne Kramer-Smyth: Alice and her friends are prepping their project of nanobots for an amazing and artistic presentation, when every sector but theirs starts losing oxygen. As the only functioning sector, they have to figure out a way to save everyone else. “The Experimental Bug "First Test"” by Jelani Akin Parham: Pilar has created a SuperSuit to protect her in her dangerous town. Her giant bug suit has some scary 'bugs' of its own that might interfere with its ability to function. “In A Whole New Light” by Michelle Leonard: Nina used to play with cousin Evan all the time, but his new crowd of friends has turned Evan into a bullying nightmare, with Nina as their main target. Can Nina use her scientific knowhow to change his attitude? “Chasing the Copper Dragon” by Karissa Laurel: In this neo-Victorian Steampunk world, Olivia is the one detecting and looking for truth. Johanna is the mechanical engineer. In this story involving flying, fire-breathing metal dragons and murder, both friends and skills will be tested. “Arch Nemesis” by Jamie Krakover: Did YOU know that the famed St. Louis Arch was actually a top-secret alien library designed to study humans and their behavior? Valerie is the only one who knows. And she's the only one who can stop it. “The Last Android” by Paige Daniels: Ava and Imogen Imogen is surviving in a post-apocalyptic world that’s lost much, including technology and scientific knowledge. Imogen finds a drone who is actually an AI named Ava, and who is her only friend. Can Imogen and Ava push forward far enough to find people who are smart enough to see Ava for the miracle she is, instead of destroying her for scraps? So my Konundrum again for the week, for the YEAR, is this: WHY aren’t there more kickass, badass girls in literature and film? There have been many times this past year I’ve felt like we’re going backward, but then I get to sit down with these Brave New Girls. It helps restore my faith, one tale at a time. Don’t forget there are 22 stories to choose from and restore your own faith with these charismatic characters. This year—the year of Wonder Woman on the big screen—was the perfect time for Brave New Girls 2 . Anyone who wants some fun with science, space, potential pasts and possible futures, all with truly cool female characters running the show, should check out Brave New Girls (Start with 1, and then move on...) Promote some STEM in your life, and the lives of girls around you, and support The Society of Women Engineers and all they are doing for science, technology, engineering and the advancement of equal opportunities across the board. I'd love to hear your views Until then, Stay Mystified! Some stories were better than others, but overall this anthology is awesome! I had a lot of fun reading the sci-fi stories with STEM girls as the lead characters, and I highly recommend this book for the tween and teen in your life (as well as for your adult self). Ideal for smart girls and boys. As usual with anthologies the quality of the individual stories varies, but all are entertaining. Paige Daniels is the pen name of Tina Closser. By day she works as an Electrical Engineer and Mom mushing her kids from gymnastics and violin practice. After the kids go to bed, she rocks out with her headphones turned to eleven and cranks out books. She is an uber science geek. If she wasn't married to the most terrific guy in the world, she would be a groupie for Adam Baldwin.